I am currently making comparably good progress with the game engine and the editor. One notable thing that I added was the mechanism to allow fore- and background graphics. It is based on sprites and is making use of the “Cookie Cutter” effect: Sprites can have a lower priority than the normal graphic on the screen. At the same time, a sprite can have a higher priority than the player sprite. The player sprite again has a higher priority than the normal character graphic, as it is supposed to be displayed over the background graphics. This obviously creates a strange situation, where the player is configured to be displayed over the character graphic, the other sprite is displayed over the player sprite, and the character graphic is displayed over the other sprite. The video chip of the C64 solves this dilemma by displaying the character graphic over the player wherever the other sprite is non-transparent. A little bit like a cookie cutter will cut out parts of the dough. Sounds complicated? It is, but it can be used to create effects like the one below, where parts of the character graphic is displayed in the foreground, and other parts are in the background. It needs some dynamic handling of the sprites, because the bridge in the video is clearly too wide to be covered by the available 6 sprites. 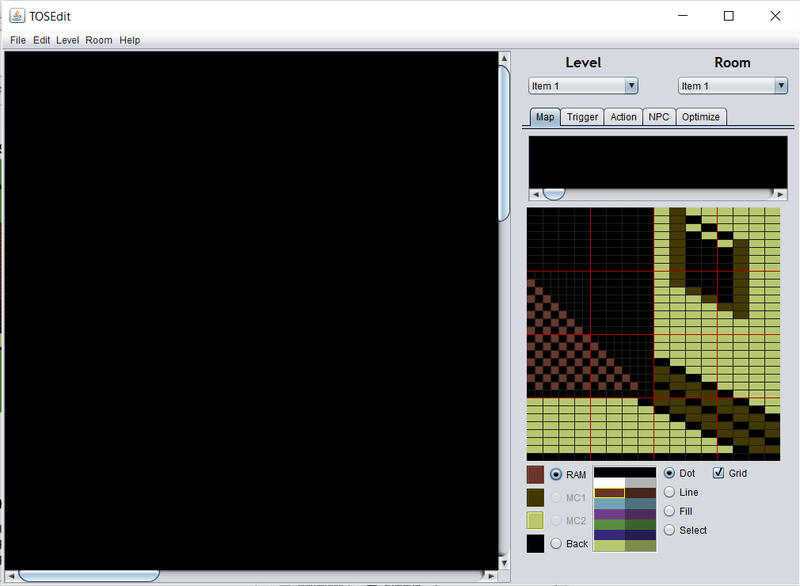 So the sprites are only enabled when there is an overlap between them and the player. Apologies for the music, I always have some arbitrary SID blaring so that I can check if the available raster time is ok. 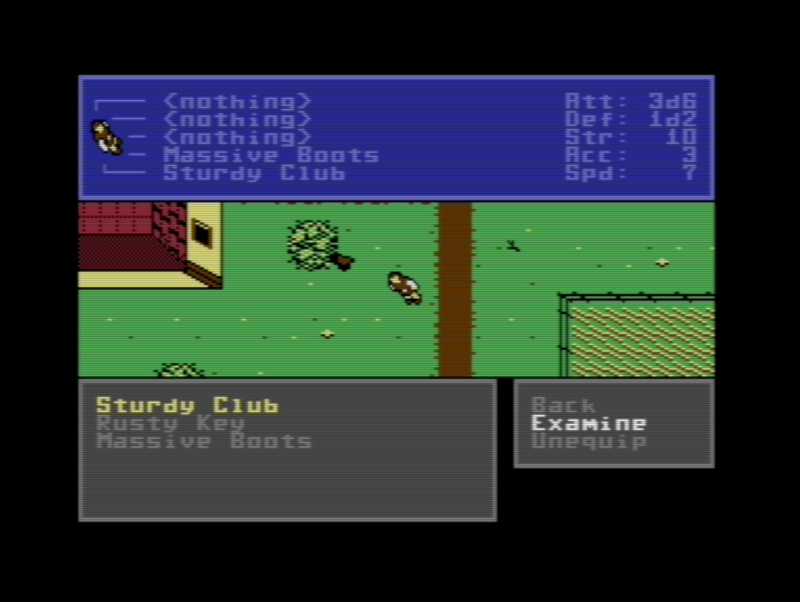 I mentioned in an earlier post already, that the ToS 2 game engine on the C64 is pretty flexible regarding the handling of character sets. The character mode on the C64, which is more or less required to create games with scrolling, makes use of one set of 256 characters at any given time. 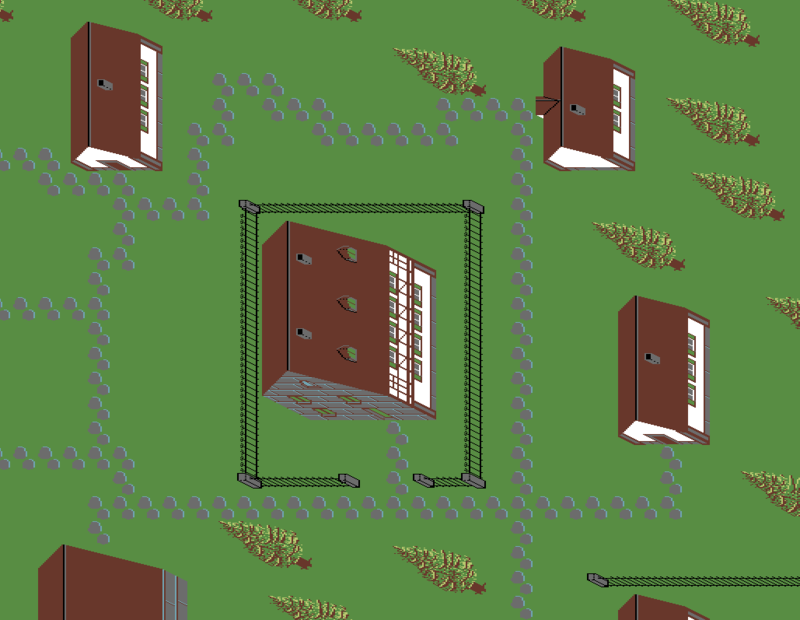 In ToS 1, every level consisted of two graphic sets, one for the outside world and one for all inside rooms. These two graphic sets had each a completely independent character set. 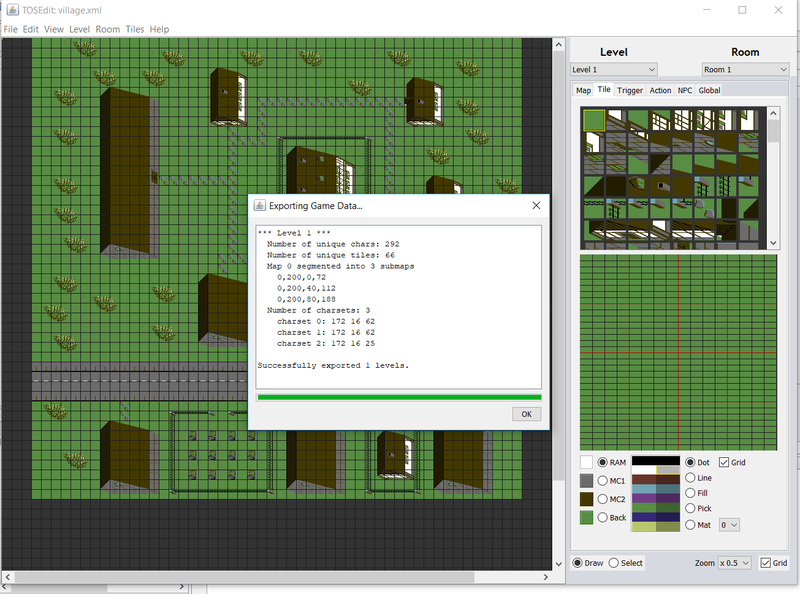 Now with the ToS 2 engine, I decided to allow to use a different graphics set for each room (with the outside world being a “room”, too). This allows for much more flexibility when designing rooms, e.g. rooms inside wooden huts, caves or palaces all in the same level. Obviously, defining the related character sets completely independently would need a huge amount of memory. Every full character set needs 2kb, so a dozen rooms would already use more than 20kb of charset data, which is by far too much. Therefore, the character sets are assembled from segments of characters, which can be combined in a mostly arbitrary manner. The picture below shows the principle. Originally I thought that one could place these segments of characters at any location in the character sets, but using arbitrary positions for the segments creates a problem: The tiles used in the engine reference the characters in the charset by index. If the same segment appears at different places in different charsets, all the characters in the segment suddenly get different indices. So if a tile that uses a character from such a segment is used in different rooms, the index in the tile definition becomes ambigious. This would mean that the tile has to be defined several times, for each of the different character sets. As tile definitions are comparably expensive (16 bytes per tile), this did not seem a good thing to do. 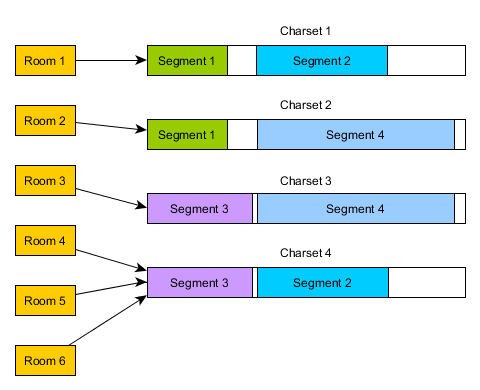 So all segments have a fixed position that is valid for all charsets in which they are used. Managing the segments and character sets looks complicated, and it is. I did not want to spend time thinking about these things while creating levels, because that can really hamper creativity. So I decided to design an automatic mechanism in the editor, that would take care of deciding about which character to put into which segment, and how to combine the segments into character sets so that they fit for the rooms and need the smallest possible amount of memory at the same time. I did not find a suitable algorithm on the Internet, although it might well be that there are some. But I had a hard time coming up with suitable search terms, as the problem to solve is rather peculiar. In the end I came up with something myself after lots of head-scratching. 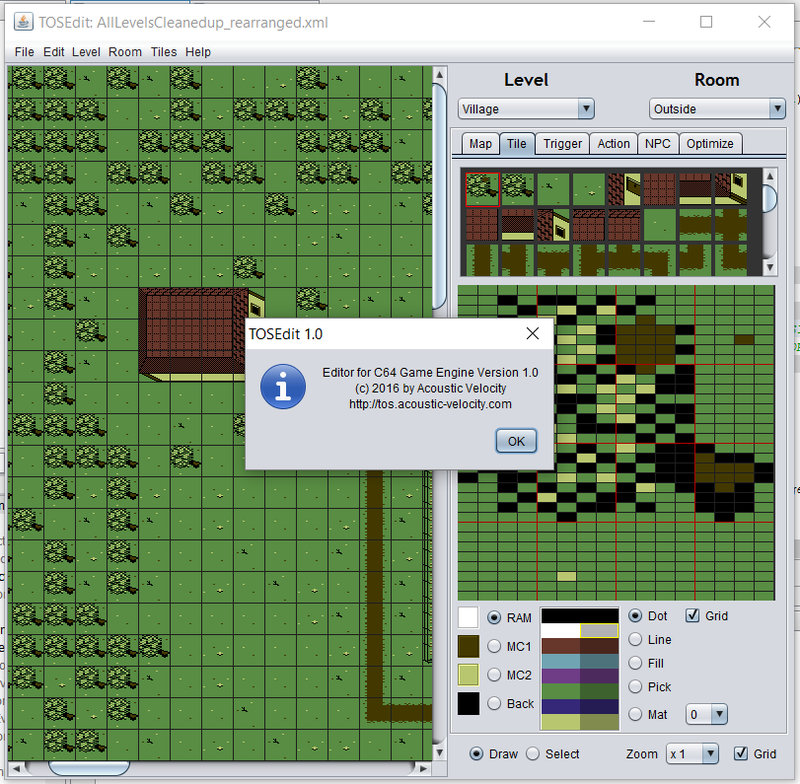 In the last month I was able to finish version 1.0 of my game data editor “TOSEdit”. 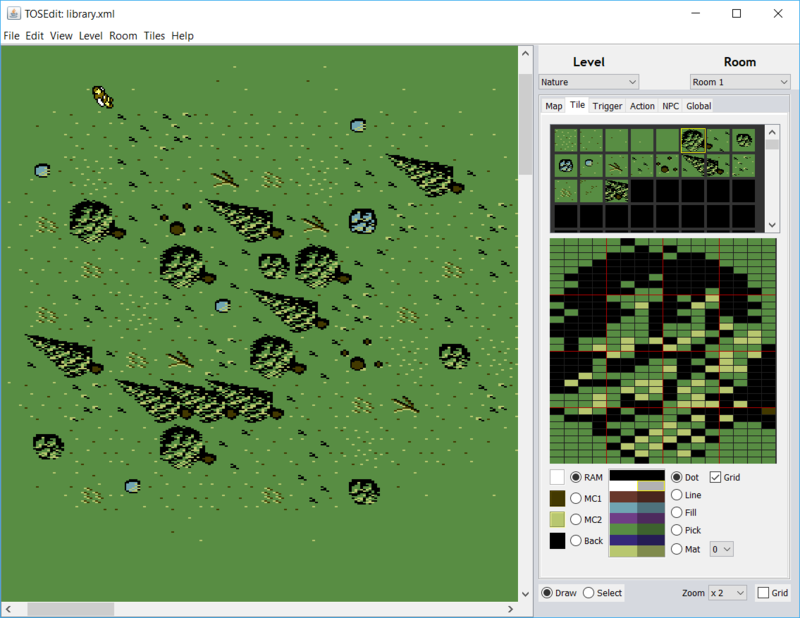 This is the first actually useful version, because it can create tiles, charsets and maps and export them in the same binary format as the wonderful CharPad. This will be the base for the further required features, that are needed to support the more special properties of the TOS2 C64 engine (like e.g. swapping parts of the charset on the fly). Interestingly, the implementation of the editing itself went pretty quickly (did I already mention that I love Java?). But what really needed time was a reasonable implementation of cut, copy and paste and of undo. I never implemented an undo mechanism before and it is actually quite a challenge. You need to do it completely for all actions that change the underlying data somehow, or it will fail miserably. Well, I was able to finish it and thought that this is worth a “release”. Where release in this context only means that I give it the satisfying version number 1.0 and write a blog post about it! I think working towards milestones and releases is so much more satisfying! When starting the work on the editor I decided to even go one step further and apply some agile methods to plan and track my progress. 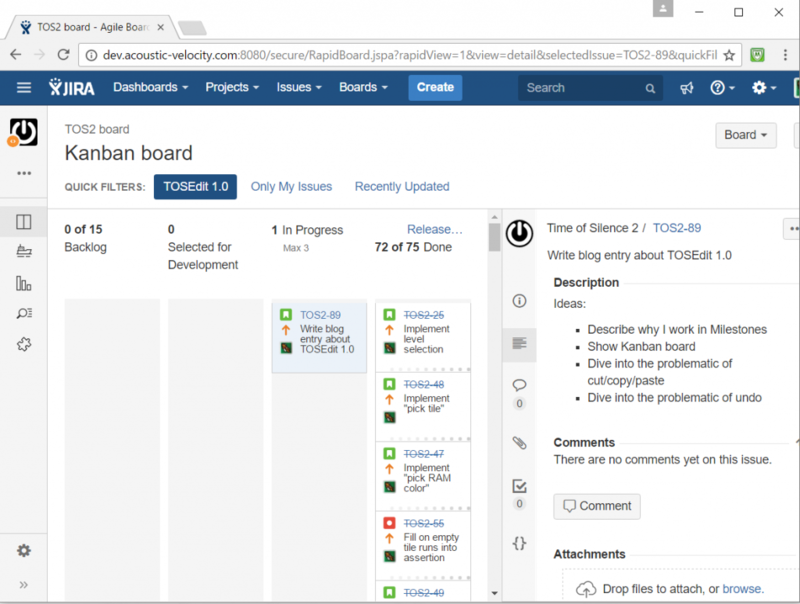 As I am the only person working on the project, Kanban seemed a reasonable method and what can I say: I love it! Kanban is a simple way to organize tasks (or rather “stories”, which are features that are needed, described from a stakeholder point of view). In my specific case there are 4 columns with such stories, a “Backlog” of things that I want to do at some time in the future, but did not think enough about that I could immediately start work on. After I spent enough thoughts about it, the story is moved to the “Selected for Development” column. When I actually start working on it, it gets moved to “In Progress” and when I finally finish it, it gets moved to “Done”. There is one specific rule that is typical in Kanban, which is that you limit the number of stories that can be in a certain column. In my case I decided to say that I never want more than 3 stories in progress. This helps to focus and get things done instead of being distracted too much. I am using the wonderful Atlassian Jira (which is free for small projects and nicely combines agile methods with bug tracking) and below is a snapshot of my Kanban board, filtered for the TOSEdit 1.0 release. You can see that there is only one issue left (which is writing this blog entry), which I will move now to the “Done” column. Really satisfying! Wow, no posts for such a long time! Well, it is summer and I have to admit that I did a bit of a break from my PC while the weather was so nice. But did I take a break from the project? No! I spent a bit of time thinking about concepts, I fought a bit with infrastructure (and actually had to change the provider of my development VServer, well you get what you pay for), and I even spent some time with scissors, paper and glue and created some prototypes for a nice packaging. Googling the Internet for creating cardboard boxes is an, um, interesting experience. Apparently only kitsch fanatic house wifes seem to care for this normally. But who says I am normal :-)! The results of all this work are nothing exciting to show off, but were important to work on at some point (at least for me, as I am a bit fanatic about the overall experience of a product). On the code side I did lots of clean-up and integrated the task scheduler and the font swapping module I wrote about further down. I wrote many many unit tests, so I am of good hope that the game will be much less bug-ridden than the compo version. It is really heavily inspired by the fantastic CharPad, I hope the creator does not see this as a plagiat, but rather a tribute to his great software! Especially the font swapping needs a lot of intelligence in the software. Apparently I was creating more questions than answering them in my last post. 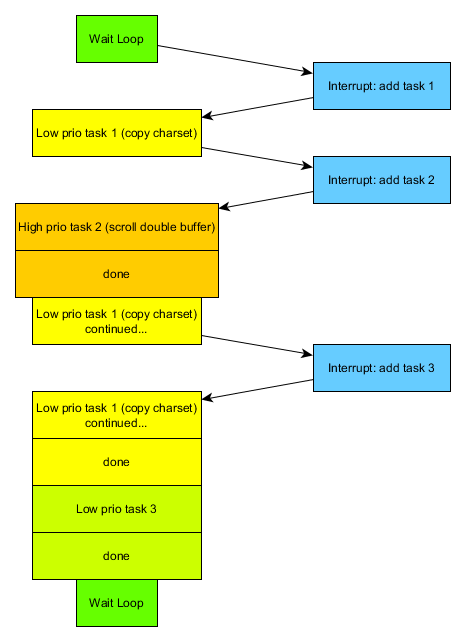 I will try to provide a bit more detail about the implementation of the task scheduler. 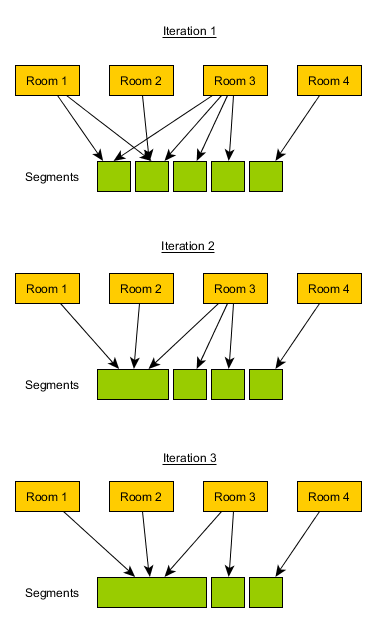 How can we manipulate the stack now to return to a different task? We simply push respective data onto the stack! When the end of the interrupt service routine is reached, it will restore Y, X and A and the final rti will pop the state register and jump to the new address we just pushed onto the stack! We do not have reasonable values for the registers (as the task was never executed before), so we simply chose 0. 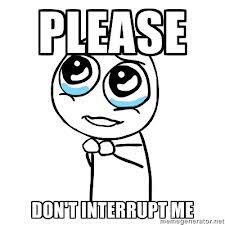 There is one caveat regarding the state register: we need to make sure that the interrupt flag is clear, or the interrupt will never be called again. It took me a while to realize this, as I was happily using php to push the current state register instead and as can be seen from step 4 above, that had the interrupt flag set. Et voilá: we restore all registers and are back in the old task! There is one additional thing that needs to be organized: when a task is added with a lower priority than the currently executed one, it needs to be stored for later. To do this, a list with upcoming tasks needs to be kept. Every time a task is done, the list needs to be searched for the next highest priority and the task needs to be pushed onto the stack as described above. But I am going to leave this little detail to be worked out by the reader (ha, I always wanted to say this cruel sentence at some point in my life)! Here we are with another rather technical update! Last time I was posting some information about how I want to get more diversity into the game graphics by switching parts of the character set on the fly while the player moves through the world. That actually raised an interesting new problem: how to handle tasks with different priorities! Up to now there were only two possible priorities: tasks that need to be done during the currently displayed frame (like color RAM scrolling or inserting new characters at the border of the screen) and tasks that only need to be finished eventually during the next frames (like scrolling the currently invisible double buffer or checking for trigger areas for events). The character set swapping adds another priority: in theory it can take quite long and there is no need to have it finished in the next 2-3 frames, it is ok even if it takes e.g. 10 frames or so. Instead of patching this into the existing engine I decided to do it right from the start and be prepared for any upcoming additional tasks. Which means: implement a task scheduler! 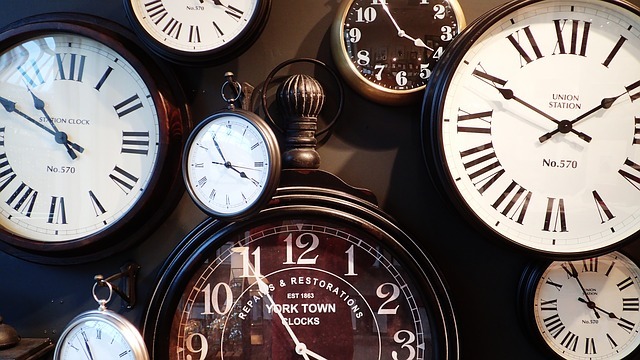 What does a task scheduler do? It makes sure, that most of the processor time is spent on the tasks with the highest priority. I simplified the concept a bit, so that higher priority tasks are always finished before lower priority tasks are continued. The implementation is actually simple, although there is some mean stack fiddling involved and it needed a bit of head scratching until I got it right. The interface of the scheduler module has only two routines: task_add, which adds a new task with a given priority and might switch to it immediately (if it is the highest priority), and task_done, which is called by a task when it is done and selects the next highest priority task to be executed. All that is needed is to modify the stack such, that the RTI instruction at the end of the interrupt routine jumps to the right task. Apologies for the clumsy block diagram trying to depict this with an example. Did I mention that I am not a graphician? In any case: implementation is done and unit tests are passing (yay! ), so I am looking forward to put this new module into good use! Last time I was talking a bit about the test framework I am setting up. I actually became a bit obsessive with this in the last weeks and spent a lot of effort to get it to a point where it fulfils everything I need. Meanwhile I am at a point where tests are run every time something is submitted to the version control system. The result can be nicely seen on a html page and a history of the last 20 tests is visible. Log files for passed and failed tests are stored and can be accessed from the html page. All in an eye pleasant view, slightly heavily inspired by a professional commercial CI system (is anyone able to guess which one? Write it into the comments and you will get personalized kudos in the next update :-)). From the screen shot above you can guess that I have some unit tests running meanwhile. I decided to run the Vice emulator using a virtual display, because that allows me to run it on my headless server and still store screenshots in case something unexpected happens. This proves to be pretty important, as my tests rely on a Vice break point to be triggered. If this does not happen for some reason (e.g. if I messed up the code and it does totally different things from what I actually intended), the test system will grab a screen shot and kill Vice after a time out. That makes it easier for me to guess what went wrong.